Yes, it’s been a while. But we got overtaken by Life and stuff, so I couldn’t keep up this blog any more. That’s the only one I have, and it may or may not correspond exactly to your particular Grasshopper. Even if it doesn’t, my own feeling is that if some aspect of your machine’s wiring is not obvious to you and you can’t work it out from this diagram, maybe it would be safer for you to have somebody else take a look at it. Elizabeth emailed me this morning and very kindly drew my attention to a wonderful ad posted by a Goodwill shop. I often think it’s a real shame that we don’t have Goodwill, or indeed Craigslist, in the UK – particularly when I see adverts like this one. 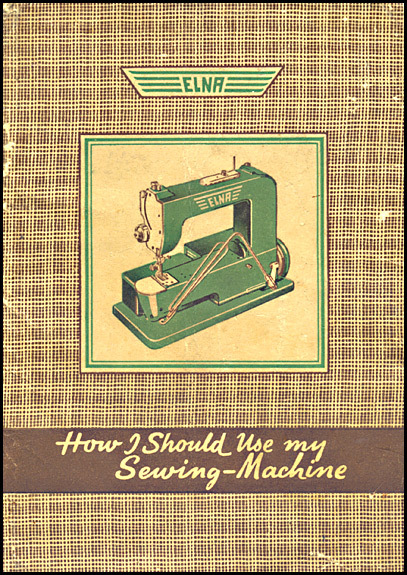 It’s for an “Elna Brand Sewing Machine in Original Box” and it’s in Indianapolis. It’s actually a Supermatic, and of course it’s not in its original box, it’s in its case. Big difference! But whatever. “Color” is listed as “Sewing machine is mint green in color”, which is fine, but we get a feel for where this ad is headed when “Pattern” is described as “Sewing machine is mainly solid in pattern”. “Condition” is the familiar “Sewing machine plugs in, light comes on and wheel turns”, which on Ebay at least often indicates a non-runner in much the same way as “needs plug” or “we don’t have the foot pedal” does. If you ever need to take the flywheel off a Grasshopper, you might like to know that, at least where the early machines are concerned, there’s a little more to it than meets the eye. Also shown in that shot is the two-part affair used on machines up to serial number 45654, and that consists of a “flywheel screw” (the long bit) and a “flywheeel pointed pin”. When you unscrew the flywheel screw, it comes out just like you’d expect, but the pointed pin doesn’t, and it’s that which will probably prevent you from being able to slide the flywheel off the shaft. 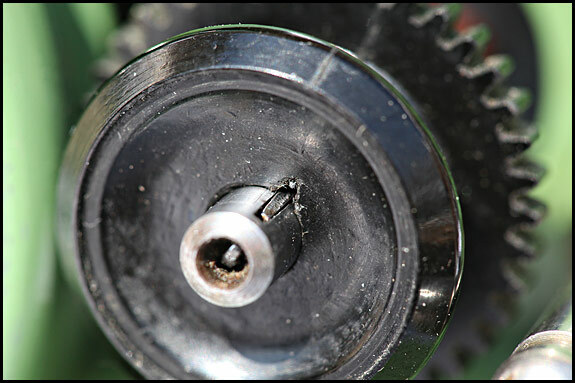 On the later Grasshoppers, the point on the end of the one-piece screw locates in the groove cut in the shaft and thereby locks flywheel to it. But on the early machines, it’s the flywheel pointed pin (the short bit) which engages in the slot. 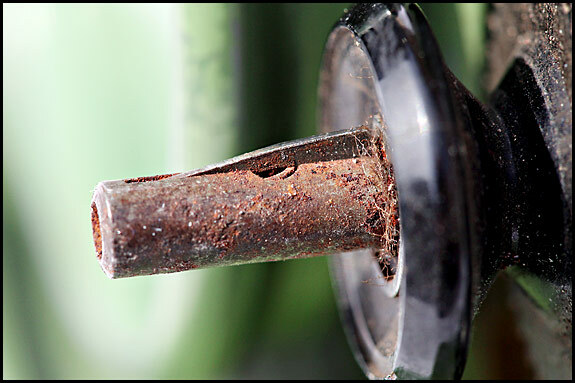 The flywheel screw only applies pressure to the pointed pin and locks it all in place. Why they did it like that is a moot point, but whatever. Here we see the “inside” of the early-type flywheel with the flywheel screw unscrewed as far as it unscrews. 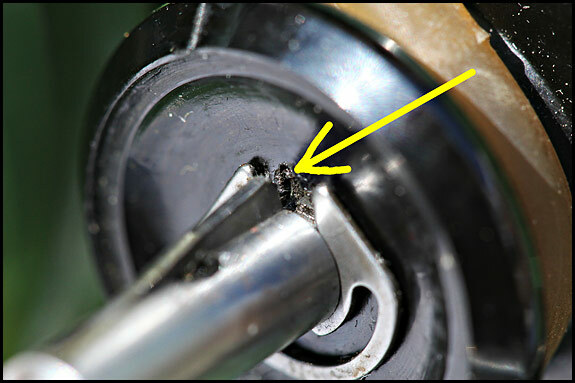 Note that the point of the flywheel pointed pin is still projecting through the bore of the flywheel, so if that flywheel was still in place on the shaft which is visible behind it in that picture, the point of the pin would still be located in the groove. In theory, you should be able to take out the screw of an early flywheel, rotate it until the screw hole is at bottom dead centre, then either tap or jiggle the flywheel, whereupon the flywheel pointed pin will obligingly fall out and you’ll be able to pull the flywheel off. In practice they tend to stick (or at least two I’ve met did), so flywheel removal on a Series One Grasshopper can become a rather protracted performance involving penetrating oil and patience. Maybe even a small gear-puller too if you can lay your hands on one. The good news is that reassembly’s a doddle with either type, and is just a case of making sure that as you slide the flywheel onto the (lightly oiled) end of the shaft, the screw hole is aligned with the slot. It helps to have the slot at top dead centre, and a small torch is handy too. Also in the Accessory Box was the elusive Tray, which is part number 503847. As time allows, I’ll try to photograph most if not all of these. 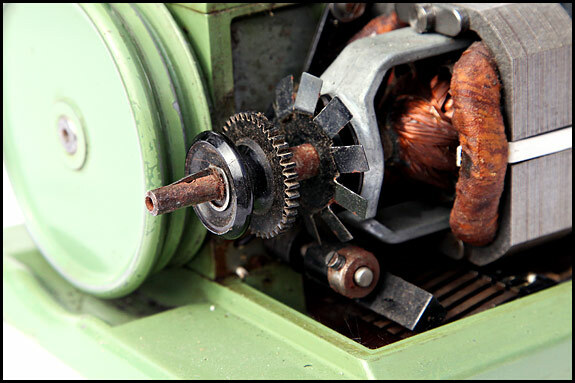 From the design point of view, one of the many really neat things about the Grasshopper is the way that when you put a bobbin on the end of the motor shaft in order to wind thread onto it, doing so disconnects the drive to the motion i.e. 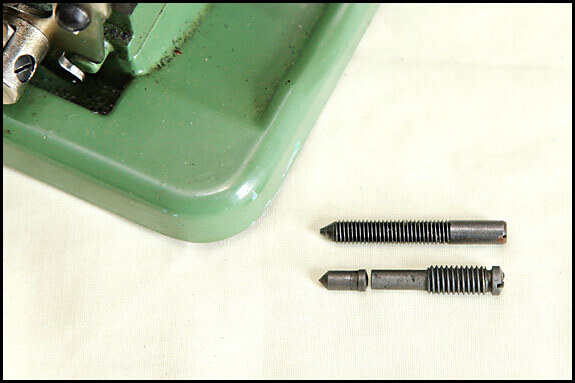 your bobbin goes round but your needle no longer goes up and down when you start the machine. I can’t with that machine, which is in a really sorry state. 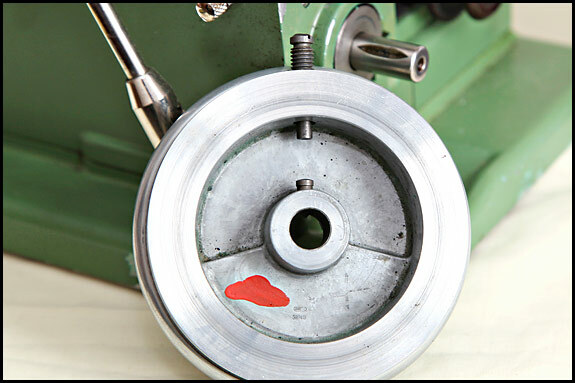 Apart from the surface rust, what’s stopping a bobbin sliding on to that shaft is shown in the picture below. The wedge-shaped doohickey running along the top of the shaft in that photo is properly called the coupling key, and it’s that which is the problem. It’s seized solid. It can’t sink down into the groove it sits in, which is what it needs to do when you slide a bobbin onto the shaft. Now, the best remedy for any problem with this particular bit of a Grasshopper depends upon three things – the precise cause, your expertise with things mechanical, and what tools and magic potions you have available. So I reckon the way forward here is to explain how the thing’s supposed to work, so that you can decide for yourself how best to proceed with your particular machine. That’s what it’s supposed to look like, and here’s how it all works. The motor pulley and the gear wheel behind it are one and the same plastic moulding, so we can ignore the gear wheel part of it here and just talk about the pulley. 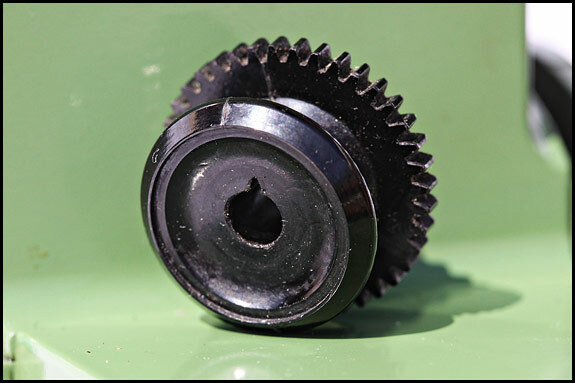 The pulley is actually free to rotate about the shaft, but it’s prevented from so doing by the coupling key, which sits in that slot in the motor shaft. Now, if you look again at that picture above, you’ll note that about halfway along the key, there’s a semi-circular depression in the shaft. That’s actually a round hole, in which sits the spring which pushes the key back up when you push down on it. It’s that key which locks the pulley to the shaft. As photographed above, when the motor shaft turns, so does the pulley, because the coupling key has coupled them together. 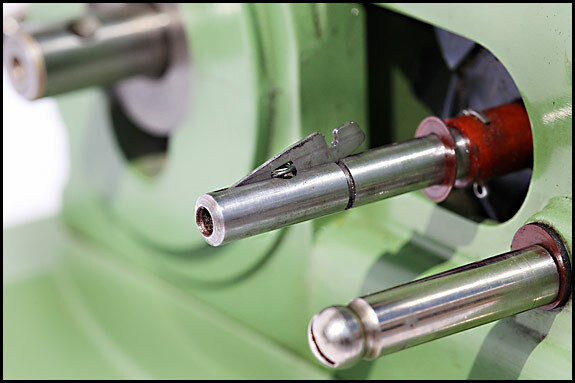 Push a bobbin onto the end of the shaft, and as you push it further on, it pushes the coupling key down into its slot. 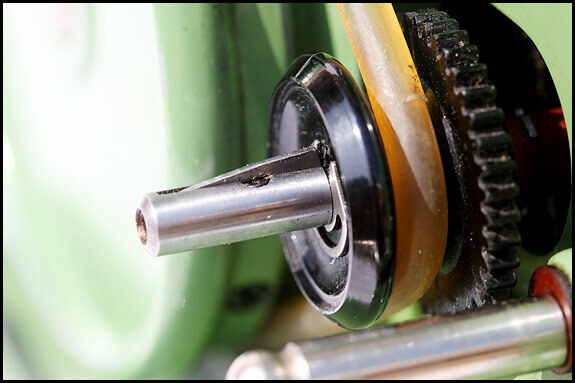 When the bobbin’s on as far as it’ll go, the drive to the motor pulley is disengaged, because what locks it to the shaft is the end of the key, which is now depressed into its slot by the bore of the bobbin. In the picture above, the arrow is pointing to the end of a slot which runs along the bore of the pulley. And what you can’t see is that the far end of the coupling key engages with that slot. It’s confusing because there’s a notch in the coupling key just where it continues into the pulley, as will shortly become apparent. Hopefully all will become clear when we take the motor pulley off, and to do that we first have to remove the circlip holding it in place. We then need to take off the flywheel, because otherwise the pulley won’t come off the end of the shaft. There’s the coupling key pushed all the way up by the little spring under it, and you can now see the notch in it that I was on about earlier. It’s the bit of the key to the right of that notch which fits into the slot in the motor pulley and so locks the pulley to the shaft, in order to transmit the drive to the motion. There’s your slot in which the end of the coupling key engages. Now you can see why, apart from anything else, this all relies on the coupling key being free to retract completely into its slot in the motor shaft and to spring back up again when pressure is taken off it. If the key won’t depress fully and return properly, you’re stuffed until you work out why and free it up so it does.